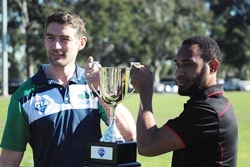 All the results from the 2014 AFL International Cup - Final Round Friday 21st August - Royal Park, Parkville, Melbourne. Excludes Men's Top 4 Grand Final (MCG) and Women's Grand Final (Punt Road Oval), both to be played Saturday 23rd August. Where possible quarter by quarter scores will be added throughout the day. Matches are 4 x 17.5 minute quarters. We suggest you refresh your browser regularly to see the latest results. Match reports will follow later. We'll publish to a Final Round photo album on Flickr after the day's play and post a separate story linking to it. Change of schedule as USA vs Nauru shifts later in the day, France vs Pakistan brought forward. Sunny conditions in Melbourne. India vs Indonesia moved to Ransford Oval. Congrats to Sweden for taking out Div 2, narrowly finishing ahead of Japan on percentage. And congrats to the Garudas getting their first-ever win.